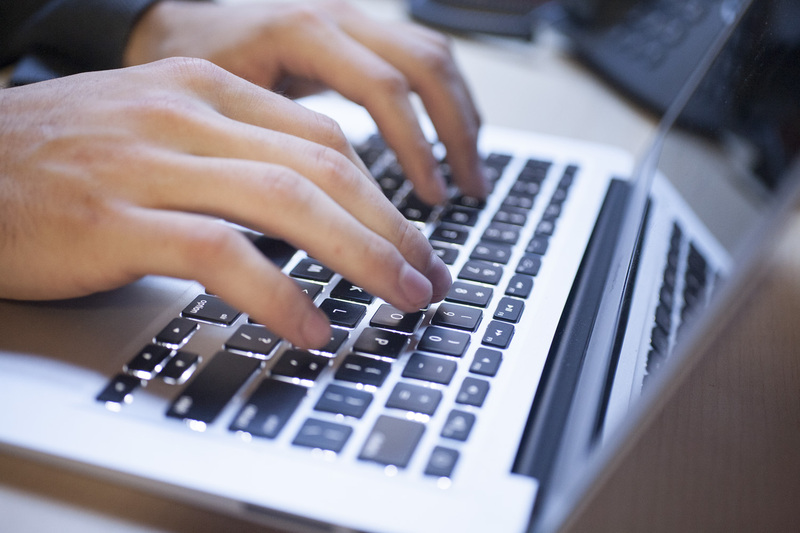 10 Must Read Trade Show and Event Marketing Industry Blogs. Tradeshow exhibit manufacturer Nimlok posted this list on their blog a couple of years ago and it still holds up. 5 Best Tradeshow Blogs to Follow comes from Models4Tradeshows. TSNN and Exhibitor Magazine make the top of the list. 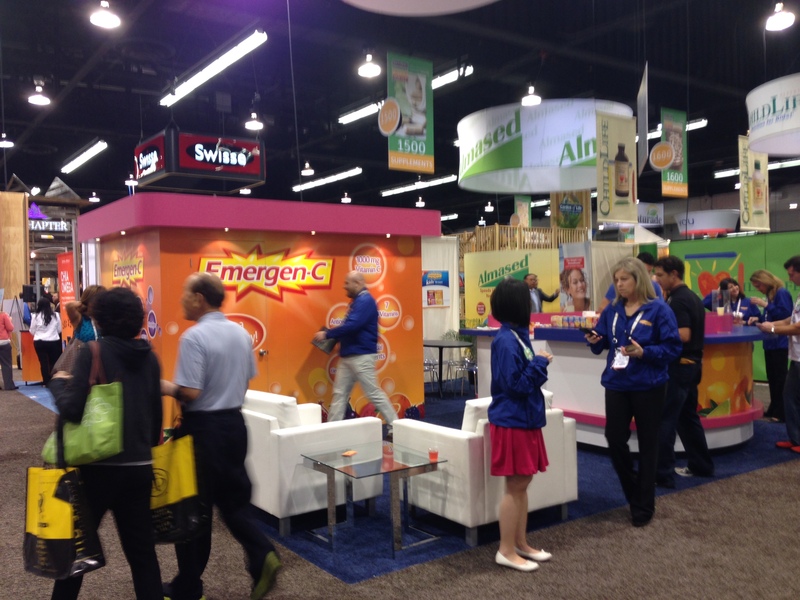 Top 10 Tradeshow Blogs to Follow comes from Brand|Greet, a marketing agency from Delaware. 8 Best Tradeshow Blogs to Follow. EventEgg posted a list a couple of years back that included a lot of the regulars: TSNN, Exhibitor, Melissa Michel and others. Top 6 Tradeshow Marketing Blogs, from Dio, a marketing agency form York, PA. Made the list here. 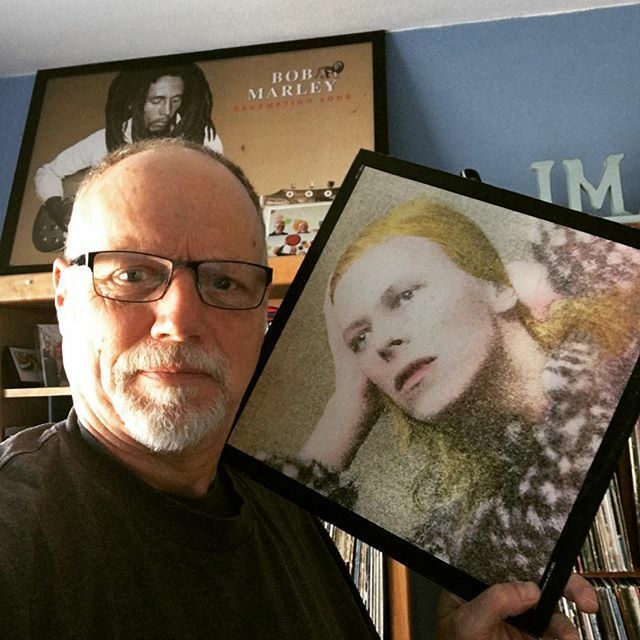 The Infotainers Blog comes from Anders Boulanger, whom I had the pleasure of meeting in person for the first time earlier this summer in Las Vegas. 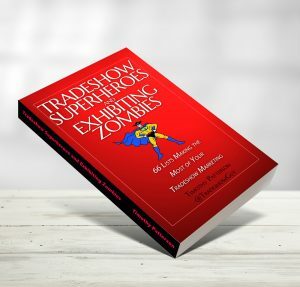 Classic Exhibits – Tradeshow Tales, an industry-centric blog is fun and always full of great information and entertainment. What is the state of the TradeshowGuy Blog in 2017? This blog started in December of 2008 with a podcast interview with Magic Seth. Since then, there have been 600+ posts that discuss and explore the tradeshow world and what it takes to succeed as a tradeshow marketer. The aim has always been to give useful information to small and medium-sized business tradeshow managers. In many ways, it’s succeeded beyond my wildest dreams. In some ways, I feel there’s much more work to do. I started the blog when I was VP of Sales and Marketing for Interpretive Exhibits in Salem, Oregon. 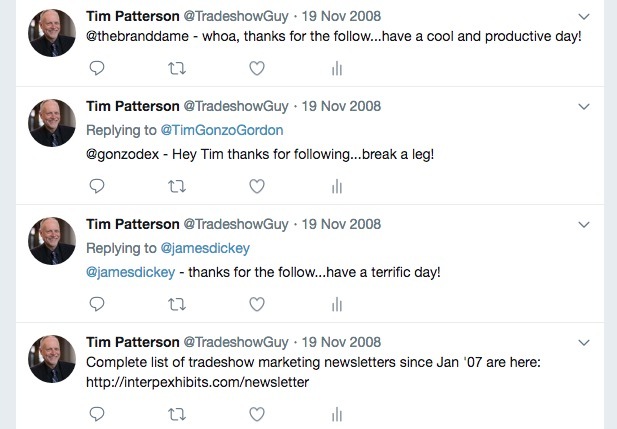 I picked the name TradeshowGuy mostly at random, but it wasn’t without some spurring by an old radio colleague who, when asking about my new job, I said I was no longer a radio guy, I was a tradeshow guy. “Tradeshow Guy!” he exclaimed. So for lack of anything better, I named the blog TradeshowGuy Blog and it’s stuck. Hell, it’s copyrighted now and my company is named TradeshowGuy Exhibits, so it must have been a good pick. Over the years I’ve followed some of the metrics associated with the blog, but I can’t say I obsess on them. 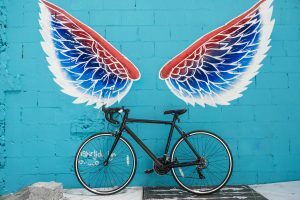 In about the fourth or fifth year of the blog, shortly after I started tracking traffic using Google Analytics, I discovered there were about 3000 visitors a month. Not a ton, but certainly nothing to sneeze at. That was when I was posting as often as I could manage something substantial. Two or three years later I was too busy to post much and I noticed that traffic had dropped to about a tenth of than, around 300 a month. Since then I’ve endeavored to post 2 – 3 times a week. Something. Anything: photo albums, tips, lists, videos, you name it. Traffic is now at its highest. 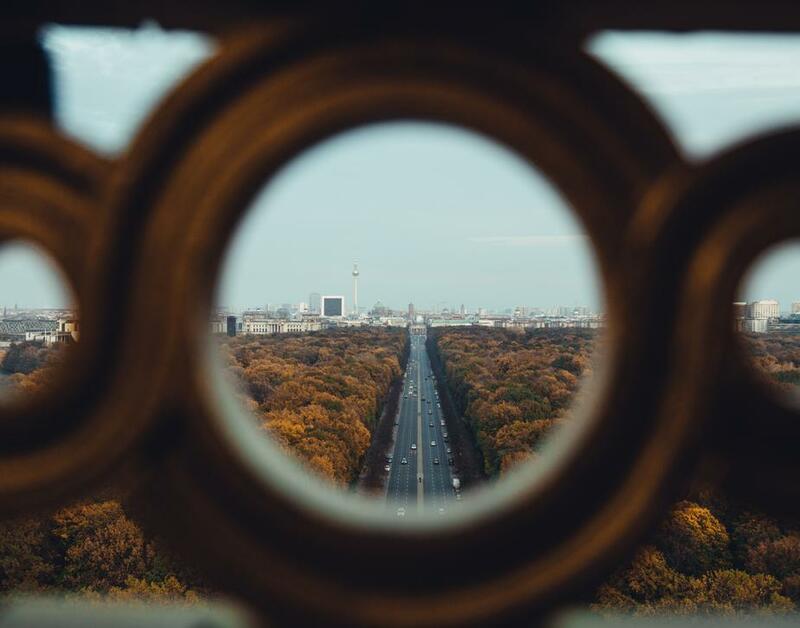 According to Sitelock, human visitors add up to over 6000 visitors a month – about 210 a day over the past three months. Buuuuut, when you look at Google Analytics, it shows 938 page views in 716 sessions with 632 users in the past month. Sitelock tracks both human and bot traffic and separates them out. Bot traffic is usually 10 – 15 times more than human traffic. Any way you look at it, traffic is there and it’s consistent. According to Google, 63% of visitors are there from organic search, and 26% comes from direct links (such as a newsletter). 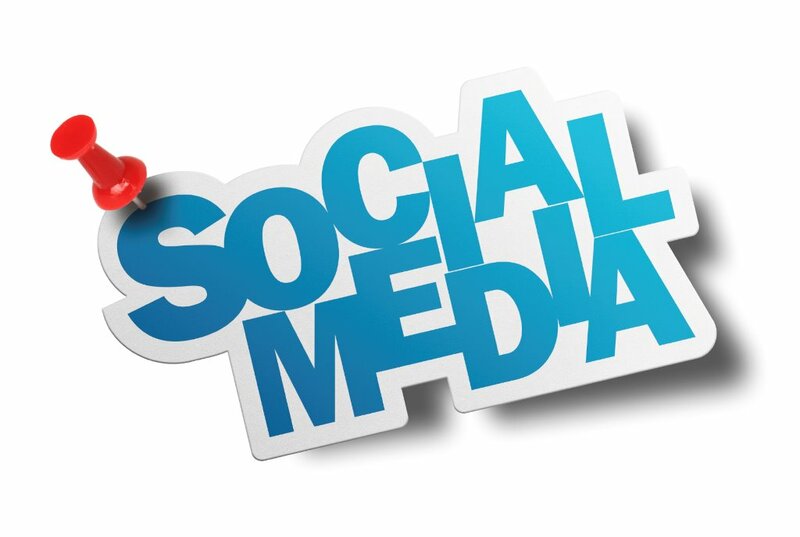 8% comes from social media links. 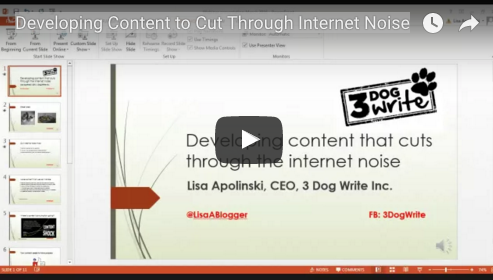 I could ramble on and on about what it takes to come up with content for the blog for hours. In fact, I have taught courses about blogging, and done webinars about blogging and creating content. But that doesn’t make it easier. In fact, I don’t even know if I have a process. But I do have a goal: create at least 2 – 3 posts per week. If I do that, I know that traffic comes and people find me more often. And I know it works. 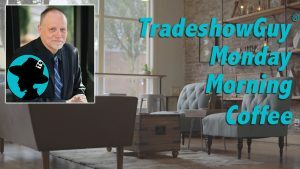 Our company TradeshowGuy Exhibits, see business as a direct result of people finding the blog and reaching out to make contact because they have questions about tradeshow marketing. Last year, in fact, over half of the business we did in dollars came as a direct result of people finding us online and either sending an email or filling out a quote request form. 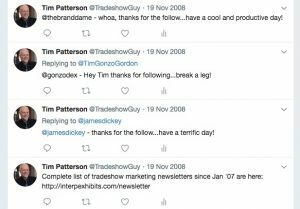 The year before, I know we acquired at least three clients as a direct result of the blog – so I know it gets attention in the tradeshow marketing industry space. But there’s no direct push-button response. There’s no way to predict these things! I can’t write eighteen blog posts and put up three videos to get a client. It just doesn’t work that way – if only it did! But when I started the blog eight years ago, I figured it couldn’t hurt. But as I said, it’s not predictable, so I don’t count on it – it’s just an additional benefit. I still do sales calls, attend tradeshows, network and prospect as any good sales person should. Blogs are not the platform that they were six or eight years ago. Popular blogs back then got a lot of comments. Now most comments end up on Facebook and comments on blogs, even really popular ones, tend to be much less than just a few years ago. Facebook is the giant gorilla in the online space, and yes, you can find our TradeshowGuy Blog page here on Facebook, where all of the posts show up. And finally, it’s worth mentioning that I’m ramping up my online visibility with the TradeshowGuy Webinars training portion. For all of 2016 I did a webinar a month, usually with a guest but sometimes not (you can find them here), and as the year wound down I decided to change it up a bit. I still use the WebinarJam/Google Hangout platform which seems to work relatively bugfree, but instead of monthly webinars, I’m doing live weekly Monday Morning Coffee gatherings and posting the video shortly thereafter on the blog. I’ve thought that I should probably podcast the audio as well, but as of today that hasn’t happened yet. I’m still trying to convince myself that the extra step is worthwhile! 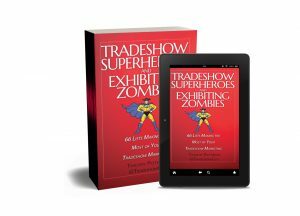 Download a free digital copy of the “Tradeshow Success” book. If you’re tasked with creating blog content, you know the challenge you’re facing. A blog has a never-ending appetite for content, whether it’s the written word, audio, photos or video. Guess what? Your next tradeshow appearance can give you weeks if not months worth of material! To do so, though, you’re got to be prepared. If you’re involved in the blog in any way, shape or form, you likely already have your ears perked up for content ideas. But at a tradeshow it’s easy to get caught up in the chaos and forget to actually make any notes until the show is over. So the first thing to do is to keep a notepad handy. Or whatever device you use to make notes. Could be your smartphone: just open up the audio recorder, make a few comments, put a label and that’s it. You can get blog post ideas from prospects, visitors and your competition. Ask questions about problems they’re looking to solve and challenges they’re facing. Ask what specific industry they’re in and jot it down. Ask what the hot items are in your visitor’s world. Note what your competition is promoting and what they’re leaving behind that surprises you. Talk to industry leaders if you can find them, ask about products and services that their customers are asking about, and ask about what problems they also face in serving their clients. Take photos and videos. If you have a client in your booth, ask them to sit down for a 60-second testimonial and ask what they like about your product. Take photos of booth staffers, managers and visitors (make sure you get names of visitors), and post them on your blog and on social media. Ask your staffers what they learned – what their takeaways were at the end of the show. Ask what worked, what didn’t. A tradeshow has oodles of ideas for content. All you have to do it be aware, make notes, record bits and pieces with your camera and write it up back at the hotel as well as when you get back to the office. You’ll have content ideas for weeks or months to come! It must be because I was a rock-and-roller from about the age of eight. Or maybe it was the first time I sat down at a drumset when I was 11 and knew I had to have one of my own. 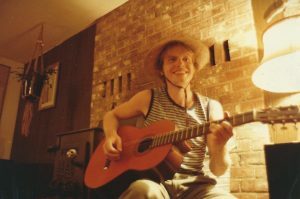 Or maybe it was when I finally figured out at the age of 16 what a bar chord on a guitar was, and how I could move it up and down the neck of the guitar for different chords. How many decades ago was this? What’s up with the goofy hat? Or maybe it’s just because I gotta have music in my life as much as possible. 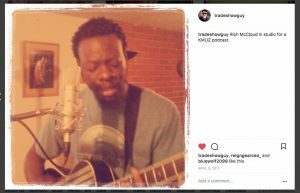 I listen all day long, and grab my guitar to work on chord progressions, play an old favorite or sit down at the drums often to bash out something. So you can imagine as my iTunes library’s some 47,412 selections (and counting) is set on shuffle day after day, I hear a lot of music. And that music inspires me in interesting directions. Like the song I’m listening to now called “The Endless Night” by Return to Forever. I put “tradeshow endless night blog post” the Google box and on the first page was a link to “Ten Very Cool Examples of Experiential Marketing” by David Moth at Ecocunsultancy. Now that’s some inspiration! Next comes “Red Rain” by Peter Gabriel. Let’s see what happens when I search for “tradeshow blog red rain.” Up came “Running a Live Lab at a Tradeshow” by Redgate on their blog. What an inspired idea for a tradeshow! Next: “Hidden Treasure” by Traffic. A search for “hidden treasure tradeshow blog” gave me “The 4 Most Annoying Hidden Tradeshow Costs” on the Expo Marketing blog. Hey, saving money on shipping, drayage, deadlines and labor is definitely inspiring! How about one more? One of my favorite Sixties bands, The Troggs, came along on my computer and played “Girl in Black.” So when I searched for “tradeshow blog girl in black,” on page one was an article from Classic Exhibits’ blog titled “What Not to Wear at a Tradeshow,” which is definitely a good read. Now that you’re found out the wide diversity of music that inspires me, I want to know – what inspires you? 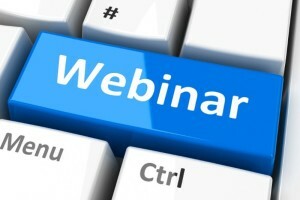 Over the years I’ve done a number of webinars, some for myself and some because other entities have asked me to do so. I’ve thought for the last year or so that I wanted to start doing them regularly, so I’ve committed to a schedule of at least one webinar a month for 2016. I’ll be using the WebinarJam platform. I checked out a number of platforms, compared costs and related tools, and think it’s a good match for what I would like to do. I’ve also joined Webinara, which is a webinar promotion platform, so we’ll see what happens with that affiliation. 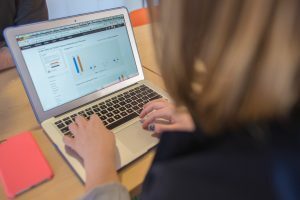 Webinara, if you aren’t familiar with them, is a Norway-based company that looks to spread the word about webinars across many different markets. Again, we’ll see what happens with that! As for the first webinar, it’s set for January 20, 2016 at 10 am Pacific. I’m going to do a Q&A on tradeshow marketing. So if you have a question, make sure you register for the webinar. It could run ten minutes, it could run 90! I don’t know. We’ll see how many people submit questions or join us online. It should be fun, and in any event, the WebinarJam platform records the webinar automatically and makes it available on my YouTube channel. Spread the word – I hope you’ll join us!